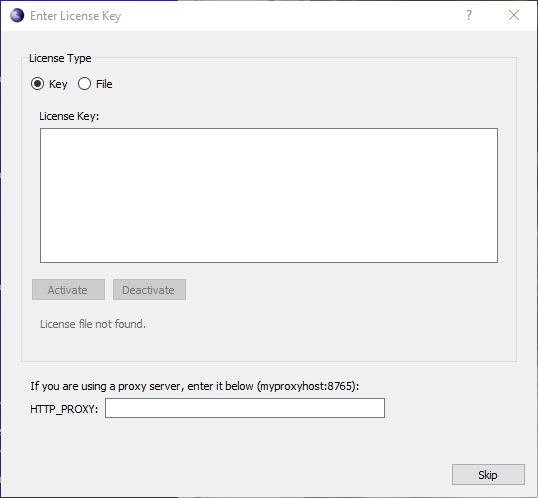 The following are procedures for activation of an ASN1C license using either the GUI or the ASN1C command-line. Procedures are provided for installing both a license key or file. 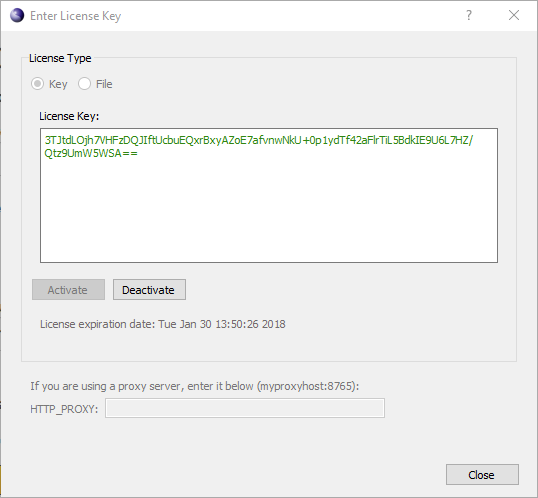 The key value would normally be obtained from the user's account page or it may have been sent via E-mail in the case of an evaluation license. Before any changes can be made, the currently active license must be deactivated by pressing the Deactivate button. 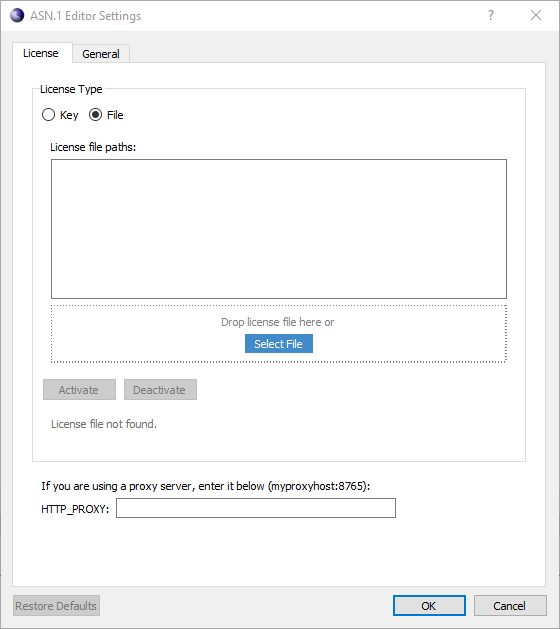 The controls allowing new license data to be entered will then be enabled. The HTTP_PROXY box in each of the dialog boxes above allows the address of a proxy server to be set. If the HTTP_PROXY environment variable is set, its contents will be shown in thix box. 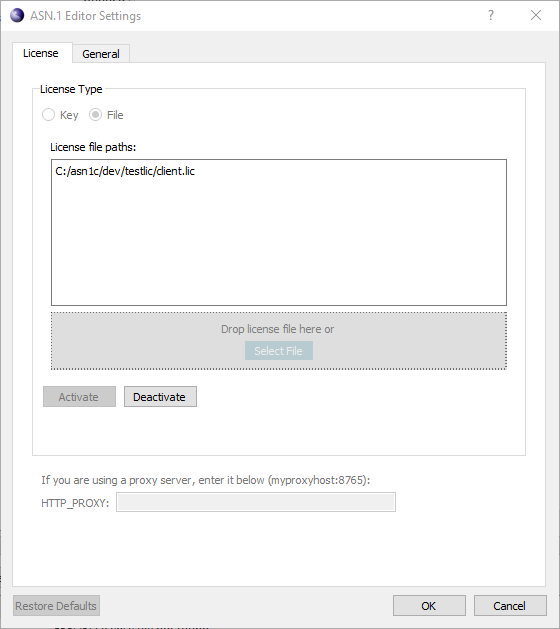 an osyslic.txt file or RLM license file with extension '.lic' may be drag-and-dropped or selected using the Select button into the license file input area. Note that as soon as the license file is dragged into the input area or selected using the button, it is activated. The Activate button remains disabled in this case. 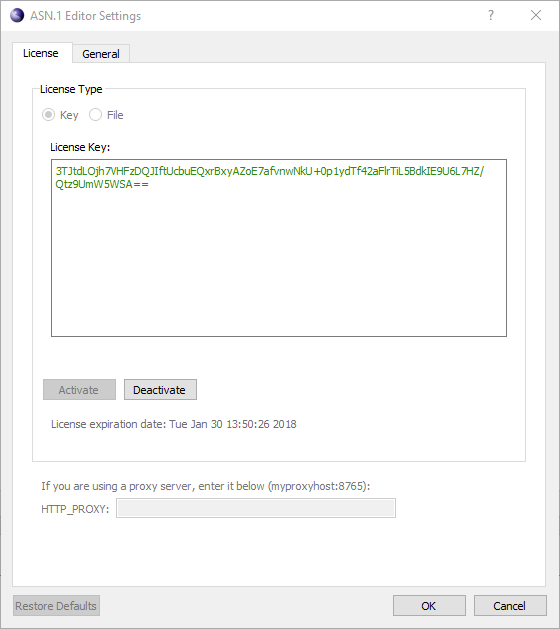 License files currenly in use can be displayed by using the 'asn1c -licfiles' command. License information can be entered from the command-line using the ASN1C -licdeact, -lickey, and -licinstall. where <key-value> would be replaced with a key value. The key value in this case must be one long contiguous string with no line breaks or other embedded whitespace. where <key-value-file> would be replaced with the full path to the file containing the key. where <file> would be replaced with the full path to an RLM or osyslic.txt license file. This fully deactivates the license in place on the machine from which it was invoked.